In 300 fewer games played than Lecavalier! In Monday night’s President’s Trophy-clinching game against the Arizona Coyotes, Steven Stamkos set a Tampa Bay Lightning franchise record for goals, with 384 in 737 games played. This beats the record set by Vincent Lecavalier of 383 goals in 1,037 games. Read about the game in the recap! Then come back and appreciate Stamkos’s moment. 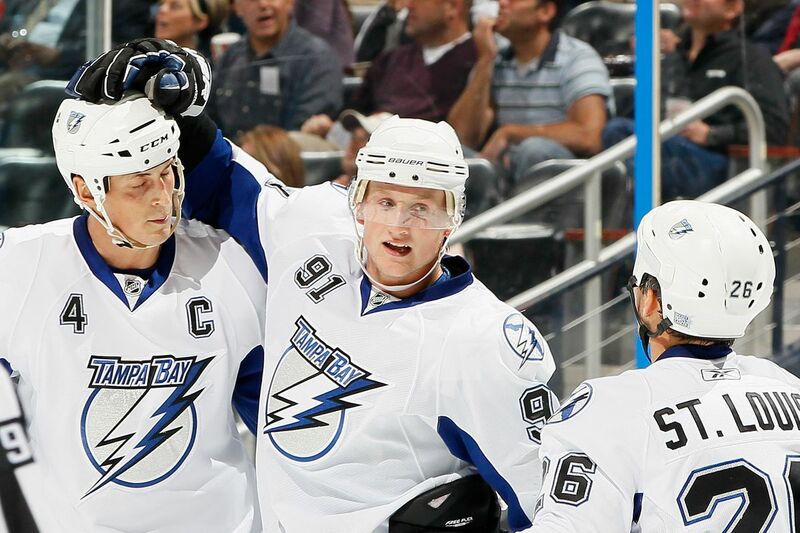 The milestone marker wasn’t the typical goal we’re used to seeing from Stamkos but was just as beautiful nonetheless. Ryan McDonagh lined up a shot from the left point and tried to squeeze the puck on target through traffic in front of the net. Stamkos was one of those bodies battling for positioning and was able to outmuscle his defender to get a stick on McDonagh’s shot and tip it past Coyotes goaltender Darcy Kuemper at 6:54 of the opening period. Times Tampa Bay Lightning center Steven Stamkos (91) beats Arizona Coyotes goaltender Darcy Kuemper (35) to score he first goal of the game and sets the Lightning franchise goal record with his 384th career goal, during first period action at Amalie Arena in Tampa, Monday evening, March 18, 2019. So, even though the onetime Spokane Chiefs junior star now earns millions not only playing in the NHL, but for one of its best regular season teams of all-time, there’s no need to remind Johnson he hasn’t yet won anything. “I totally had him glove side.” @martel2626 & @domingue35 getting in on the #WFFDribble action today! This is Gaunce’s second call-up of the season as he previously spent just under two weeks with the team at the end of October into early November. He did not appear in a game during that span. If not for the emergence of Erik Cernak on the blue line as a very capable player, Gaunce may have had other opportunities for recall and to get into the lineup as well. As it is, Gaunce will serve as the seventh defenseman, assuming that no one else is injured. This week had a little bit of everything for the Orlando Solar Bears as they continued their push towards a Kelly Cup playoff berth. There was a rally against the first place team in the South Division, an offensive explosion against one of the top goaltenders in the ECHL, and a lot of time spent in the penalty box. March Madness? How about March Maskness! Daniel Walcott is in a blue practice jersey, back on Syracuse ice! Goals in back-to-back games, including a two-goal game on Saturday. With 69 points, @CVerhaeghe21 has the most points in a single season since we affiliated with the @TBLightning. Logan’s dad Kelly said the renaming of the rink means a lot to him and his family. Logan lost his life nearly one year ago in the Humboldt Broncos bus crash that killed 16 people and injured 13 others north of Tisdale. Quick Strikes: The Yzerman era ends in Tampa Bay In the words of Mr. Vinik, May he build the second-best team. Quick Strikes: Andrei Vasilevskiy nominated for Vezina for second year in a row And in less good news, the Crunch face elimination in their next game. Syracuse Crunch lose 5-1 to Cleveland Monsters; face elimination on Tuesday Game Two is deja vu for the Crunch as they are unable to solve Cleveland’s shotblocking schemes. Report: The Tampa Bay Lightning are interested in Russian defenceman Artyom Sergeyev Via Sport Business Online. A special Lightning season ends with disappointment and frustration Sports. Sometimes they’re bad. This Article has a component height of 67. The sidebar size is long.